FOOTBALL RUMOURS: Two Clucas bids rejected by Spireites, Springthorpe could be a Stags target, Ward off to Forest? Chesterfield’s resolve looks set to be tested this summer after bids from two clubs for Sam Clucas were turned down. Clucas joined Chesterfield from rivals Mansfield Town in September and has gone on to make 49 appearances, scoring 12 goals, in his first season in League One as the Spireites reached the play-offs. He arrived at the Proact as a left winger but has been used on the same side in defence and in the final third of the pitch alongside Eoin Doyle before the Irishman’s move to Cardiff City in February. Championship side Cardiff have long been admirers of the 24-year-old, who is contracted to Chesterfield until the summer of 2017, with Reading and Wigan Athletic also among a growing number of suitors. But the Spireites have deemed both offers - one of which from Wigan - for Clucas as unacceptable and new manager Dean Saunders is expected to have a fight on his hands to keep last season’s squad together. Former Fleetwood Town goalkeeper Mason Springthorpe is said to be interesting Mansfield Town, Carlisle United and York City. The 20-year-old joined Everton for £125,000 from Shrewsbury Town in February 2011 but never played a competitive match, spending a month on loan at Woking in January 2014. Reports suggest Fleetwood want to loan him out for the season, but are wrong as he is a free agent, having been released by boss Graham Alexander a couple of weeks ago. Stags need one, possibly two keepers after releasing Sasha Studer and Lenny Pidgeley completing a loan spell before being released by Newport. Pidgeley and another former Stags loanee Lewis Price are also possible targets. Nottingham Forest are rumoured to be on the verge of signing former Derby County and Chesterfield star Jamie Ward (29) on a free transfer. 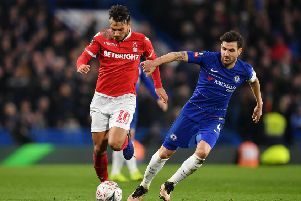 Forest were said to be initially put off pursuing Ward because his wage demands would be more than the £10,000-a-week limit that Forest can’t exceed under their Financial Fair Play embargo. But the chance to stay in the East Midlands with a promotion-chasing Championship side is believed to have tempted Ward into talks and some reports suggest he has already had a medical. Northern Ireland international Ward scored six goals in 29 appearances for the Rams last season. Stevenage have been given permission to speak to West Ham coach Teddy Sheringham about taking over as manager, it has been claimed. Sky Sports have alleged that Boro want the former Tottenham Hotspur and England striker to replace Graham Westley. Nicky Hunt and Rob Atkinson are both set to leave the Crown Ground when their Accrington Stanley contracts expire, having turned down new deals, while experienced defender Brian Saah is to leave Dagenham & Redbridge. Carlisle United boss Keith Curle has agreed a deal to sign midfielder Jason Kennedy once he is released from Bradford this summer. Portsmouth striker Ryan Taylor has left Fratton Park after the club decided not to offer him a new deal. Cambridge United have signed centre-back Leon Legge on a two year deal from League One side Gillingham.